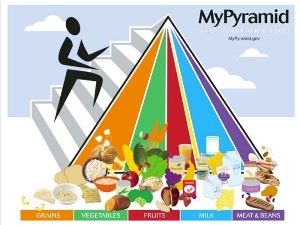 What is the "new food pyramid" and the latest "food plate"? By now you would have heard the above new buzzwords. Now what is all this about? Over the years the health authorities all over the world embraced the concept of the 6 food groups to educate the population about proper nutrition. As time went by, the food groups and their application were altered to promote a more balanced and healthy lifestyle. Lots of emphasis was given to exercise as a necessary element of this healthy lifestyle. 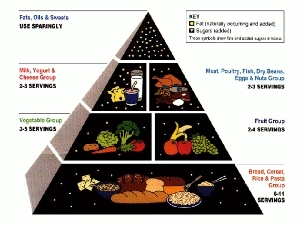 After almost two decades, the USDA food pyramid is history. 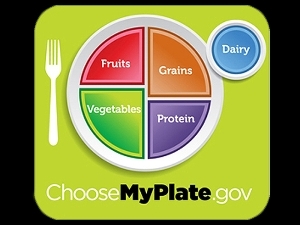 First Lady Michelle Obama today unveiled the USDA's update on America's visual nutrition guide, replacing the familiar - and much maligned - pyramid with a plate. The food pyramid has been around since 1992, but nutrition experts don't seem to be mourning its demise. "It's going to be hard not to do better than the current pyramid, which basically conveys no useful information," Dr. Walter C. Willett, chairman of the nutrition department at the Harvard School of Public Health, told the New York Times. - Compare sodium in foods like soup, bread, and frozen meals - and choose the foods with lower numbers. Experts argued the now-defunct pyramid lumped all types of foods in its design - including unhealthy ones at the top of the pyramid. That made it hard to tell which foods were better choices. "The original icon was a bit misleading, e.g., all fats are bad," Dr. Sara Bleich, an assistant professor of public health at Johns Hopkins University, told ABC News. USDA spent $2 million to design and promote the plate, the Times reported. Will this costly venture cause Americans to eat better? Dr. Robert C. Post, deputy director of the USDA, told the Times that he hopes the new visual will prompt "consumers to say, 'I need to be a little more concerned about what I choose to build a healthy day's diet.'" I would say that this is a development in the right direction, with more common sense being displayed by the institutions that supposedly have our best interest at heart. But, although this is a very necessary tool to educate people, it is up to every individual to decide to look after his/her own health.